"Does a choice transmitting antenna always constitute the best receiving antenna?" 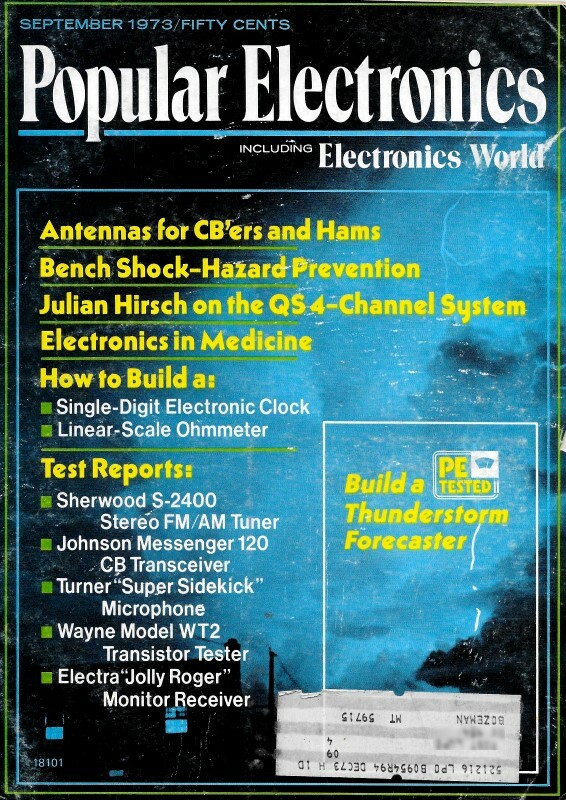 That question alone, by author Carl Eller, piques my interest and gives confidence that this article is the type I have long said is lacking in the amateur antenna system design realm. Most treatises, it seems, address only the transmit half of the operation. Just as with the old aviation adage that with enough power you can make a brick fly, in the non-professional world the attitude is often that a really crappy base antenna / transmission line / power amplifier mismatch is fine as long a tuner is capable of brining the VSWR into an acceptable range (2:1 or better is preferred). That translates into a lot of loss from the sky to the equipment. All loss (attenuation), whether resistive or reactive, adds directly to the noise figure of a receiver, and therefore to the reduction of minimum discernible signal (MDS) level. Radiating peak envelope power (PEP) from your antenna so that someone on the other side of the world can hear you does not do much good if your antenna-to-receiver loss is so great that the response signal gets buried in the noise. Part 2 appeared in the October issue, which I do not have yet. Fig. 1 - Parameters for a normal mode helix. You can calculate various dimensions for the 27-MHz CB using 36.3 feet for lambda. Antenna is used for long-range communications at low frequencies. It is easier to resonate by external tuning than a monopole antenna of the equivalent height. If radio amateurs and CB'ers devoted as much thought, time, and money to their (largely) nondirectional high-frequency antennas as they do to their directional beams, there might be a much wider variety of both single- and multi-band antennas. Most of us, though are content to use purely conventional horizontal dipoles, inverted V's, or ground-plane, quarter-wave verticals. These, as a rule, give satisfying results - perhaps because we've been conditioned to think of such antennas as standards of comparison. Once in a while, however, some adventurous soul chooses a rhombic or a long-wire V - some even try disc-cones or fat monopoles. Such departures from the norm often are quite rewarding. Their users discover the convenience of having an antenna that's truly effective over a wide band of frequencies, one that achieves this advantage without tuned feeders or other auxiliaries. Then there are those who, by force of circumstance, are driven to the use of restricted-space antennas. These antennas are approached with trepidation since both theory and popular supposition hold them to be nearly useless because of low efficiency or narrow bandwidth. Portable and emergency operations present another set of problems. Just how much like the "ideal" antenna must a radiator be to put out an effective signal? Is there danger of damage to one's transmitter from using unconventional antennas? Questions. What are the facts? Is it true that there is no radiating system that combines good efficiency, wide bandwidth, and reasonable space? How vital to acceptable operation are such factors as careful design, meticulous attention to the impedance match between feeder and antenna, and supporting the antenna as high as possible? Does a choice transmitting antenna always constitute the best receiving antenna? Is the buried wire antenna a myth or a reality? What about loop antennas for receiving and for transmitting? How do the small ones compare with the large ones? How important is capture space? Does a wire have to be stretched out, or can it be coiled and still retain good radiation characteristics? Just how vital is a good ground to the performance of a Hertz antenna? A Fuchs? A Marconi? What about feedline losses in h-f antenna systems? How does one use a counterpoise? Does it have to be under the antenna? Does one use a single wire or many? How high above ground should it be? Should a ground connection be used in conjunction with a counterpoise? If so, how should it be connected? And what do you do when you're caught in a situation where you can't use one of the conventional antennas? Just what can you use as a substitute? Can you expect any truly useful radiation from unconventional radiators? Well, we are not going to provide full answers to all of these questions. But we will review the opinions of some of the better authorities on the subject and hopefully, we will stimulate your thinking about some ideas that deviate from the humdrum and timeworn traditions. Let's think first about that ideal combination: good efficiency, wide bandwidth, and small size. No really good solution exists to the simultaneous achievement of all three of these goals. However there are some ways of approaching the ideal. Fig. 2 - Cage type of multi-wire dipole. Though a two-wire feeder is shown, this antenna can be adapted to conventional 52-ohm coaxial feedline. Normal Mode Helix. 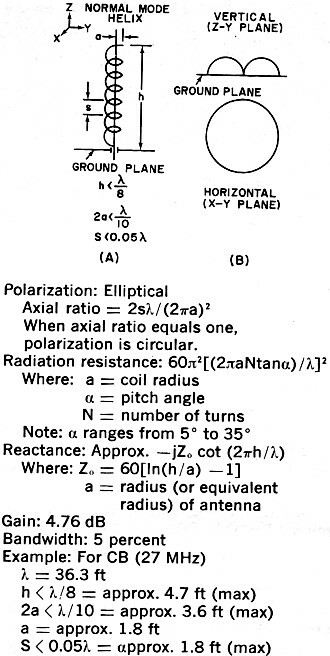 One approach, which lies within the constructional abilities of the average amateur, is the "normal mode helix" (from Sylvania Antenna Reference Index, Sylvania Electronic Systems). Used as a vertical radiator and worked against a ground plane or a good ground, it has a nondirectional horizontal radiation pattern, and the vertical pattern is of a reasonably low angle. By varying the dimensions, the polarization can be made either elliptical or circular. As compared with an isotropic radiator, the gain is 4.76 dB. Bear in mind that a conventional dipole has only 2.15 dB gain. The bandwidth of 5% is not too impressive, but the helix is easily resonated by external tuning units. This gives promise of extending the bandwidth substantially without too much drop in efficiency. There are whispers to the effect that the use of a ferrite core in the helix performs wonders in retaining efficiency while making possible drastic reductions in overall dimensions. Other whispers say that getting a type of ferrite usable for high power and high frequency poses limitations. In each case, the probable definitions of high power and high frequency are such that a kilowatt of dc input power and a frequency range of 1.8 MHz to 30 MHz are wholly feasible. Why do we say whispers? There is reason to believe that the findings of research in this field are classified - after initial and excited announcements, all reference to the subject disappeared from the technical literature. Figure 1 shows the form and dimensions of the normal mode helix. The wire or tubing used to make the helix should be heavy enough to hold its form with a minimum of support. Of course, it should also have a low skin resistance. Polished copper protected from corrosion by some type of weather-proof varnish is quite acceptable. Broadband Dipole. Although they take a lot of space, variants of the prosaic half-wave dipole offer exciting possibilities. They can be really broadband if you get rid of the concept of a thin-wire radiator. Figure 2 shows one broadbanding possibility. The use of the multi-wire radiator transforms the dipole from a narrowband device to one that is good for at least two adjacent bands plus everything in between. The multi-wire flat-top, flared from a common feedpoint, is easy to build but a bit awkward to keep in position in order to maintain a constant capacitance to ground. This may require as many as five supports - one at the center and one at each end of the two spreaders. Research indicates that, for the greatest bandwidth, the wires of the flat-top should be of unequal length, approaching a quarter-wave (per half of the dipole) for the lowest and the highest frequency included in the design. In all cases, the wires must terminate in an insulator; do not interconnect them at the far end. Although it is more trouble to construct, the cage antenna, another old but sadly neglected design, presents no problem in maintaining a constant capacitance to ground. Usually, it is built with conductive circular spreaders every few feet of its length, with the middle (at the feedpoint) and the far ends tapered to a point for ease in attaching to an insulator. There is no verified opinion as to whether better performance would be obtained by using nonconductive spreaders and terminating each wire with an insulator. Such a practice, however, is employed in the "fat" monopoles used extensively by the military (Fig. 3). This type of monopole has a diameter at its broadest point that is an appreciable fraction of its height. In this configuration, the bandwidth is slightly over three to one! Centered at 7 MHz, it would be quite effective at 3.5 MHz and 14 MHz, as well as every frequency between. In such applications, using a "fat" conductor (usually multi-wire) has an effect on the antenna's radiation resistance, reactance, length for a given frequency, and ohmic resistance. Each of these effects is a desirable one! The total effect on the feedpoint impedance is not so drastic as to interdict the use of the popular 52-ohm coaxial cable as a feeder; it really more nearly approaches a true match (not that this is of any great importance). The amount of reduction, from the formula 492/f (where f is in megahertz) for computing the length of a dipole, depends on so many factors that it is best arrived at by experimentation. Fortunately, the antenna is so broadband that a near-miss approximation probably will suffice. In the matter of reduction of ohmic resistance, a small improvement in overall efficiency will be obtained. Other than in exceptional instances, the ohmic resistance of an antenna is not of paramount importance. Fig. 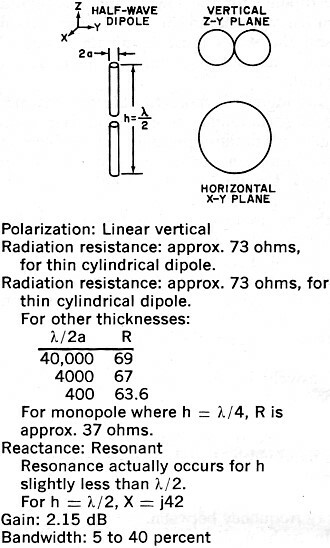 3 - Shown here as a vertical, rotating the dipole to horizontal plane swaps the radiation patterns and changes polarization to linear horizontal. Structure need not be solid as a cage retains same characteristics. Note small change in radiation resistance for large change in diameter. Impedance Matching. Impedance matching, that interest-provoking interface between feeder and antenna feed point, is so hedged in by what is half truth and half superstition that one hesitates to discuss it for fear of affronting the pietistic convictions of some devotee of a particular school of belief. Really, though, it is a simple matter. Basically, any generator delivers maximum power to its load when that load matches the internal impedance of the generator. If they are not matched initially, we make them match by some means of impedance transformation. Take the audio output of a receiver as an example. If the amplifier is a vacuum tube, it may need a load of 4000 ohms. The speaker offers only eight ohms. So, we use a transformer to effect the impedance transformation. There is no sacrosanct law that says the matching transformer has to be mounted on the speaker; it may be in the receiver. Now, have you ever heard of an audiophile demanding an eight-ohm cable to feed the audio from the receiver to the speaker? The very same situation and considerations are involved in feeding r-f energy from the active device (vacuum tube, transistor, Gunn diode, or what-have-you) in a radio transmitter to its load, the antenna. As it's highly improbable that there is a natural impedance match, you use some form of impedance transformation. A bit of this is built into the transmitter. Because of cost considerations, manufacturers make a sharp limitation in the flexibility of this built-in feature; so you may have to supplement it with an external device. For example, suppose that you have an antenna operating in the high-frequency range (3 MHz to 30 MHz) and you are feeding it with RG-8/U cable. The antenna is constructed so that its feedpoint impedance is 12.8 ohms. This would result in a 4:1 VSWR on the feedline if no corrective measures were taken. But corrective measures can be taken: such as, using an impedance matching device similar to the Drake MN-4 or the Johnson Matchbox on the tower supporting the feedpoint. The device can be adjusted to transform the 12.8-ohm impedance into a resistive load of 52 ohms. Then the RG-8/U will have no standing waves along its length and the transmitter will load into it quite readily. But suppose you don't like the idea of climbing the tower every time you want to shift operations to another band? You can connect the RG-8/U directly to the dipole (using a 1:1 balun if you like) and move the impedance-matching device down next to the transmitter. The transmitter will not know the difference because it is still working into a 52-ohm load. But what about that length of RG-8/U, which now has a 4:1 VSWR? This is no problem since the only thing bad about it is that a very tiny portion of your r-f power will be dissipated in heating parts of the coaxial cable. Since you're operating in the h-f band, these heated spots will be at the current maximums. On the 3.5-MHz band, these would be only at 132-ft intervals; and how long is your feeder? Even on the 29-MHz band, you'd probably have only two or three spots where a few milliwatts would be wasted in heat. It's very difficult to convince many people of these simple facts. They have been brainwashed by those who have not made a careful study of the subject. Collins Radio Company, in its publication "Engineering Compendium, High Frequency Antennas," (which we recommend) states, with regard to reflected power, "It is important to appreciate the fact that reflected power does not constitute a system loss." Similar statements appear in other well-edited and authoritative publications, yet the myth of reflected power loss dies slowly. To ascertain the nature of power in the reflected wave and its relation to power in the incident wave in a mismatched transmission line, an experiment was conducted. A transmitter operating on 7 MHz was connected through an r-f wattmeter and a length of RG-8/U cable to a 52-ohm resistive load. The transmitter was adjusted to provide a measured output of 100 watts; its de power input was noted and logged. Then the transmitter was connected through an r-f wattmeter to an impedance-matching network, through it to a forward-and-reflected-power meter, and on through RG-8/U cable to a 12.8-ohm load made up of four 52-ohm resistive loads in parallel. The transmitter was loaded to 100 watts power output, indicated both by the r-f wattmeter and by the same dc power input as before. As this loading was being done, the impedance-matching device was adjusted to reflect a 52 ohm resistive load to the transmitter. Between the impedance-matching device and the cable, the forward r-f power meter indicated 120 watts of forward power. This would make it appear that a purely passive device was generating 20 watts of r-f power. Switching the meter to read reflected power resulted in an indication of 20 watts, precisely the amount of the extra forward power. If stronger proof were needed of the fact that reflected power does not constitute a system loss, one could insert an r-f ammeter in series with the feedline at the junction with the 12.8-ohm load. Its reading, squared and multiplied by 12.8, would indicate a full 100 watts of r-f power delivered to the load. Such verification was made in a prior experiment. In the second and concluding part of this article we will discuss other antenna types and related topics.